Melasma is a light to dark brown pigmentation that can appear on the forehead, cheeks, upper lip and chin of mostly woman. 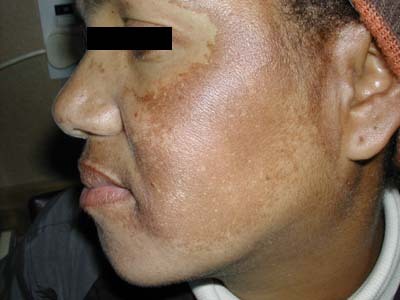 Melasma is caused by an increase in melanin production. It most often occurs in women over 25. There are quite a few treatment options for Melasma, but whatever treatment option is chosen the regular application of a sunblock combined with minimizing sun exposure is essential. If possible also stop the Oral Contraceptive Pill. One good way to treat Melasma is the application of a specially mixed Hydroquinone containing cream plus good sunblock for at least one month. This is followed, if required, by treatment with an IPL or laser. The specially mixed Hydroquinone cream, if it is working well enough, can be continued for as long a the Melasma improves. The IPL or laser treatments can also be repeated. Melasma is prone to recurrence so maintenance treatment is important. Once an acceptable level of improvement is achieved the patient must continue with sunblock during the day and a milder melanin suppressing cream, like Differin or Skinoren cream, at night.